Crunch time! Three more weeks left and it is too close to call. Matthew Murray has a shaky hold of first place and most of the pack has the same record of 3-3! Should be a very exciting 3rd trimester with no player having a lock on T4 or 10th place! 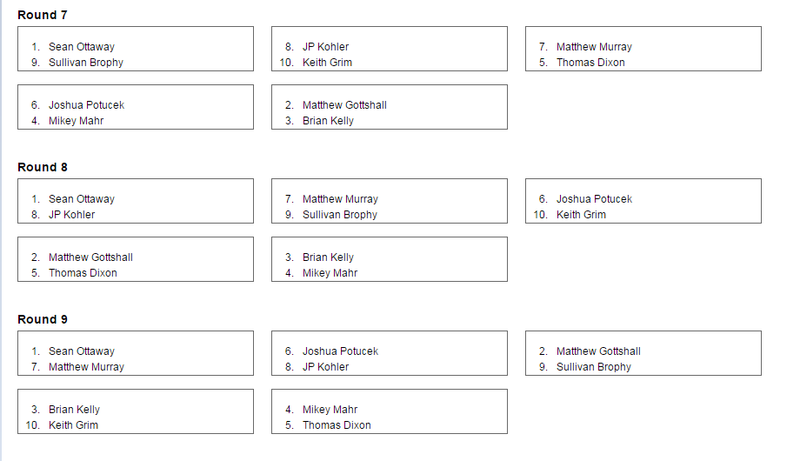 For 3/13, 3/27 and 4/3 here are the final pairings! We will be taking 3/20 off as multiple people won't be able to make it. I'm sorry for Mickey, but the rest of participants are really close and they will have to make very good choices for this last trimester Good luck to everyone! The start of Trimester 3 and crunch time is upon us! Pregame starts at 8:30 est/5:30 pst with matches starting at 9est/6pst! Join us for the final stretch for what will be a very tight road to the finish!! 9/10 players are live for Top 4 and 7/10 have a possibility for last place. Too close to call so lets just leave it to the games! JP does not pay 2 life for first tomb activation :p And that was relevant since turns later he is at 3 (should be at 1) and Keith's metamorph would be a tangle so JP taps all and next turn Keith attacks with 2 creatures. Well, triskellion finished it. It was the most interesting round, some MUD mirrors are really tactical!